The thought of starting a decorating project is exciting or scary, depending on your experience, your budget, your taste, or your time. If you've never done any decorating at all, you might feel that you don't know how or where to start. If this is old hat to you, you might not know where to end. But when all is said and done, you want a new look and want to get started. There's very little question about what element to choose last, but there are lots of things you can select first. Because paint is a very inexpensive part of the project and because paint is available in an almost infinite varity of colors, you should hold off buying the paint until you have other things identified. But just what should you do first? Should you buy a whole roomful of furniture or choose a rug that you love? Have you chosen an elegant wallpaper or luxurious fabric that you want to use? You really can start wherever you want and work it all together into a plan. But it really does help if you start with a plan, an inspiration piece, and a color sheme. Find your sources of inspiration and work your way through your decorating project. You'll be happy you spent the time to plan. As with any business plan, you should draw up a written statement for your project. Identify your style and then select a color scheme around your theme. Will you choose a garden style or a sleek contemporary decorating scheme? Put it in writing and stick to it. Do you like formal or casual? Do you love French Country style or do you long to live in a cottage style home? Spend some time to identify the style elements you love, and make plans to bring them into your space. Not everyone (in fact, very few people) can start with a fresh, empty room and begin decorating. Most of us already have some pieces of furniture or the home has carpeting, tile floors or countertops, or architectural features that you're not ready to discard. If there are things you like, focus on them and make them important. If there are things you don't like but cannot change, find ways to camouflage or downplay them in your newly decorated space. Do You Have Decorative Pieces? If you have a collection of beautiful crystal, delicate china, or rustic birdhouses, these can be the start of a decorating plan. Based on the color schemes, decorative themes, or formality of your collection, you can use them to identify the start of your decorating project. If you're not sure how you should start your decorating project, read our list of places to look for ideas, color, and themes. Often the art you choose to live with reflects what you like. If you choose beautiful landscape oil paintings, you'll probably like a traditional or formal interior. 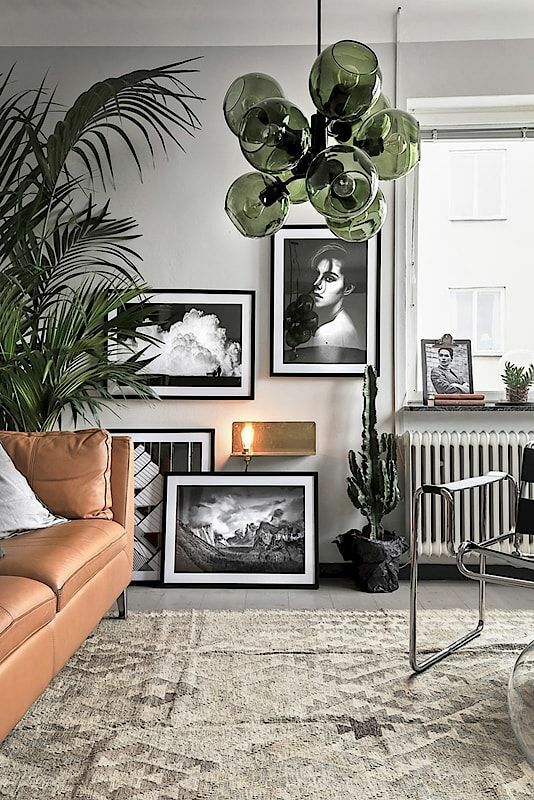 But if you choose black and white or sepia tone photographs or abstract art, you might want to plan your interior around a more contemporary design. I have a friend who loves anything blue. Of course, then it is only natural that her home would be predominantly blue, too. If you have a favorite color, use it to guide your color scheme[/link for your home. Use hues of it on the walls, in patterns, on upholstery, and in the accessories. Possibly the most common way of beginning a decorating project is to select a fabric with colors, a pattern, and interesting texture you like. Use the colors in the fabric to identify colors you'll use on the walls, on other pieces of furniture, and in accessories you choose. You can choose a pattern for wallpaper, carpeting, tile. It can be scrolling, geometric, bold or subtle. Use it as the foundation for the other elements in your home and carry the pattern into lamps, fabrics, and accessories. With a patterned area rug, you can keep other elements simple, focusing on the rug instead of fabrics or walls. But if you want to use the rug as a starting point for everything else, pick colors from the pattern and use them throughout the room on walls, fabrics, furniture, and accessories. More Decorating Rules Worth Breaking!